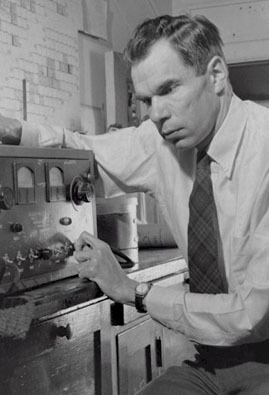 American physicist Glenn Seaborg led the research team that discovered plutonium in 1940, and in 1941 isolated Uranium-233. He oversaw plutonium manufacturing and enrichment research for the Manhattan Project, culminating in the development of atomic weapons. Seaborg and his colleagues also discovered americium, berkelium, californium, curium, einsteinium, fermium, mendelevium, and nobelium, and identified more than 100 element isotopes throughout the periodic table. He shared the 1951 Nobel Prize for Chemistry with Edwin M. McMillan, and he is the namesake of seaborgium, discovered in 1974 by Albert Ghiorso. In 1963 he served as a key scientific and diplomatic negotiator in work that led to the Limited Nuclear Test-Ban Treaty (1963), which limited the testing of nuclear weapons in the atmosphere and under the sea, and the Nuclear Non-Proliferation Treaty (1968), which limited the spread of nuclear weapons technology. His wife, Helen Griggs, was the secretary to Nobel laureate Ernest Lawrence.